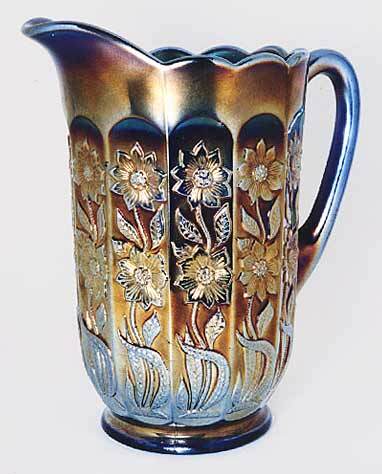 No tumblers are known that match the pitcher pattern. 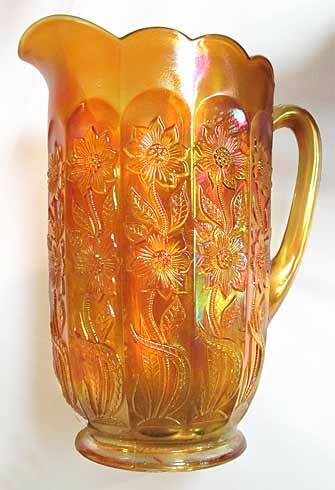 Some collectors wonder if the Milady tumblers were intended for this pitcher as well. Few of these pitchers come on the market. In 2006, Sally Marbich of Pennsylvania, sent me a photo of her green pitcher, so at least one exists in that color. The marigold water pitcher is quite rare in Starflower. Here is a photo of one sent by Carl and Eunice Booker. It sold at the 2013 Great Lakes club convention auction for $2,400.